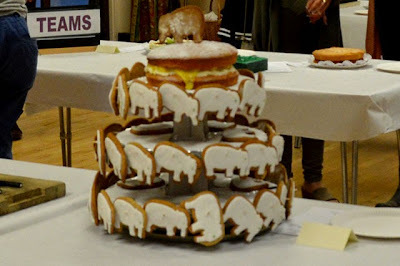 A few photographs taken at the Bake Off event, held on Sunday 17th May. A cake made by Burton Green School, depicting the school and Burton Green Farm. Visitors were invited to taste each of the cakes, and to to mark them (as shown in the photo just below). 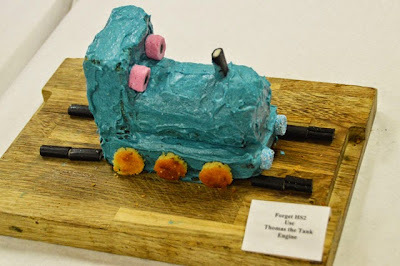 Thomas the Tank Engine, one of several railway themed cakes. 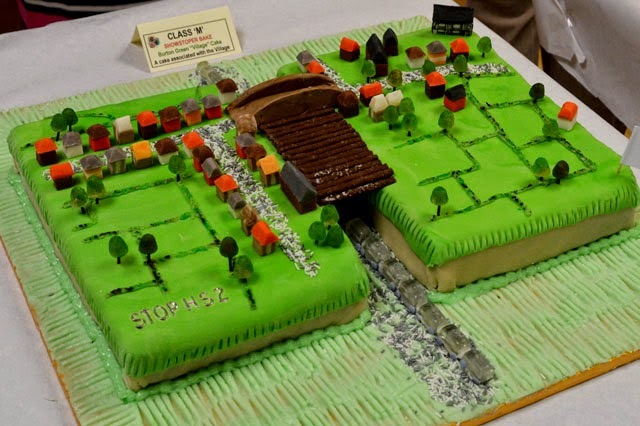 And shown just below, an elaborate representation of Burton Green with proposed railway. This incident may be important to anyone who takes walks along the Greenway. 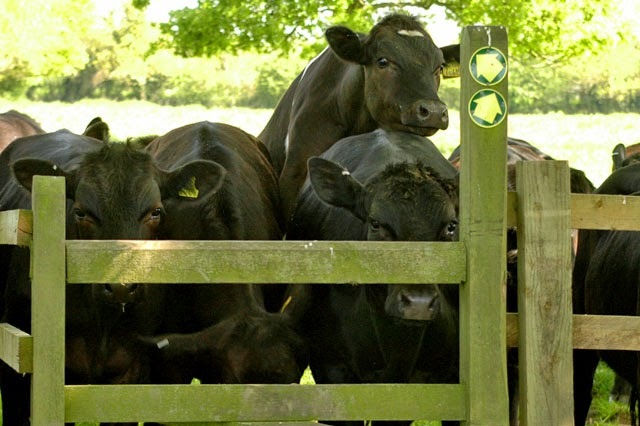 A man has been seriously injured through being trampled by a herd cows. A report in the Coventry Telegraph says that the ambulance service was called to the disused railway line on Wednesday morning, 13th May. A fast response paramedic, an ambulance, and two air ambulances all attended the scene. 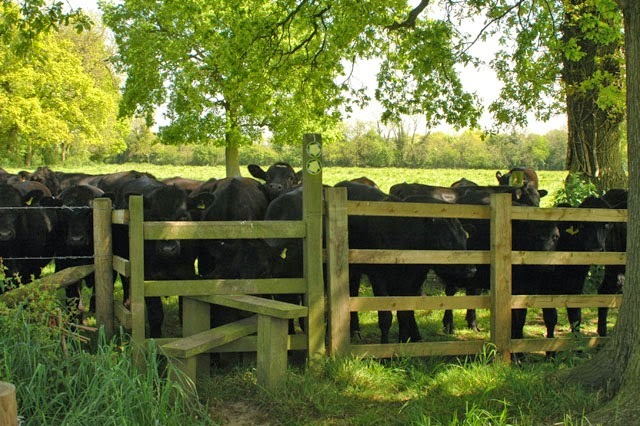 I have myself walked along public footpaths, off the Greenway, which lead through fields containing cows, and they can be threatening. A part-time gardener is required. Just a couple of hours work occasionally. Would suit a retired person who has a knowledge of gardening. This end of Waste Lane. Please note that there is a gardening club in Balsall Common. Their members would have such skills and might possibly be available. Hilary Cox; Andy Gibbs; Terry Heyes; Judi Hibberd; Janet Hickinbottom; Bron Putnam; Rona Taylor ; Faith Ward; Mary Webb. Collect perennials from Coventry CC Mary and Hilary . The minutes of the previous meeting of March 10th 2015 were approved. Terry reported that there had been some significant expenditure but much of this had been from ring fenced funds. For example, the outlay of almost £1k for the circus event was high but it was hoped this would be replenished by ticket sales. Terry warned that an eye needed to be kept on costs. It was agreed to see if competitive quotes could be obtained for the Bugle and that costly inserts should be avoided. 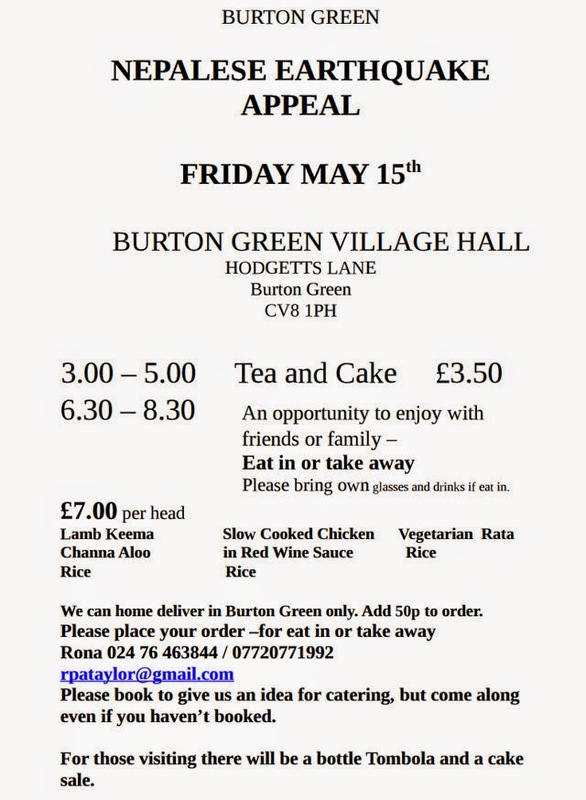 The fundraising event (Friday May 15th) for the victims of the Nepal earthquake would pay the money into the BGRA accounts temporarily. It was discussed how the funds should be paid out as it was intended to pay to a Gurkha contact of Peter Stanworth’s. Rona would clarify this with Peter and Wendy Exton. The annual insurance premium was due for renewal costing £159 plus an additional fee for toilet hire. This was the same cover and same cost as last year so it was agreed to go ahead with thanks to Lesley Tacon for sorting it out. 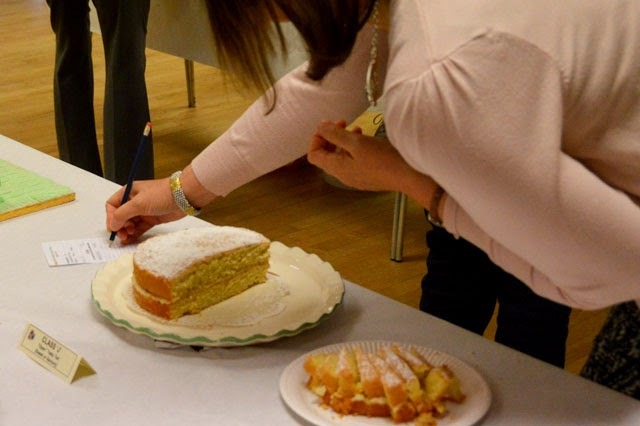 Mary pointed out there was an extra £25 to be added to the accounts for the Macmillan Cancer coffee morning. Thanks were given to Terry. Wendy Exton had instigated getting a group together to raise money for the victims of the Nepal earthquake, as mentioned above. 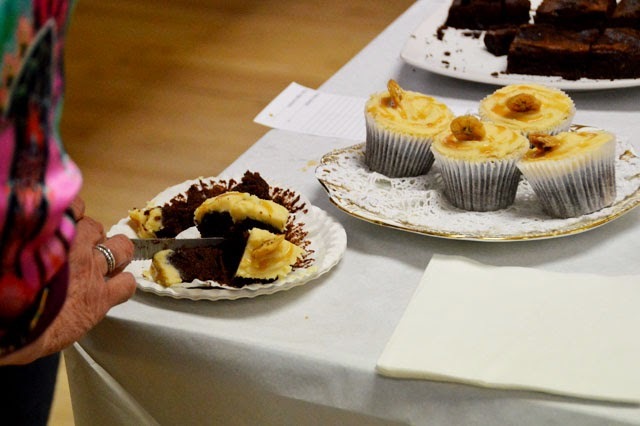 The event was to take place on May 15th with two sessions serving food from 3-5p.m. and from 6.30 to 8.30. Information had been widely circulated. 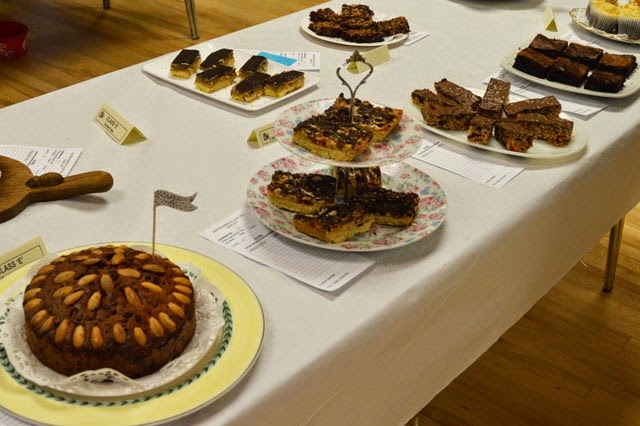 Deirdre and Dipa were doing the cooking with help from Mary and Janet S. The aim was to raise £1k. Posters were available. There was an idea to build a link with a school in Nepal and this would be discussed with Sue Patterson at Burton Green School. This was not directly a BGRA matter and would be left to Wendy Exton. Community Fund: post hybrid bill-bidding. Andy said it was proposed to make available a community fund to those affected by HS2. Even though the sum mooted was £30m, this would have to benefit a wide range of communities. There were to be two options: one for small schemes and a second for bigger schemes with match funding. Nothing had yet been announced apart from the concept. Details would not be available till after the royal assent in 2016 at earliest. Nonetheless, it was deemed sensible to have ideas ready as there would no doubt be many groups bidding for the funds. WCC was looking for ideas. 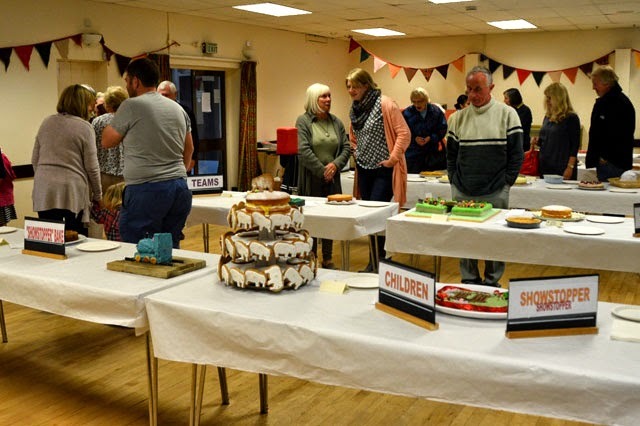 Andy said it was best to separate ideas from those connected to the Village Hall as discussions about these were already taking place. 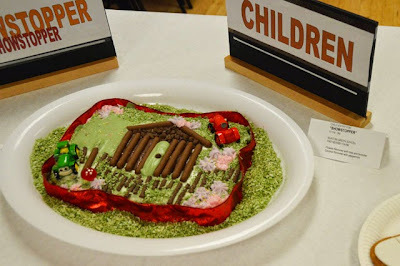 Several suggestions were made including a play area which would accommodate all ages, including adults (with outdoor fitness stations); a community minibus or other transport; a community café; a community workshop. Further detail could not be decided at this stage. Andy agreed to send ideas to Sara Board at WCC and if there was interest the schemes could be developed further. Speedwatch. Terry said this was generally going well. Participants were often subjected to verbal abuse but he said that “came with the territory.” With the longer days, the team was able to extend its times of operation. Following training, they were now recording a greater number of vehicles but most were in the 30-40 mph bracket, which was an improvement. Thanks were given to Terry and the team. Heart Start April 24th. Thanks were expressed to Alice for organising the event. Next time it needed better publicity but it was an incredibly useful course. Rona would write to Alice and the team thanking them and suggesting an annual refresher course to which young people of all ages would be welcome. Broadband Update. Mary had been provided with a list of the houses which would be eligible for the broadband update within the next 6 months. Leaflets were allocated to people to distribute. 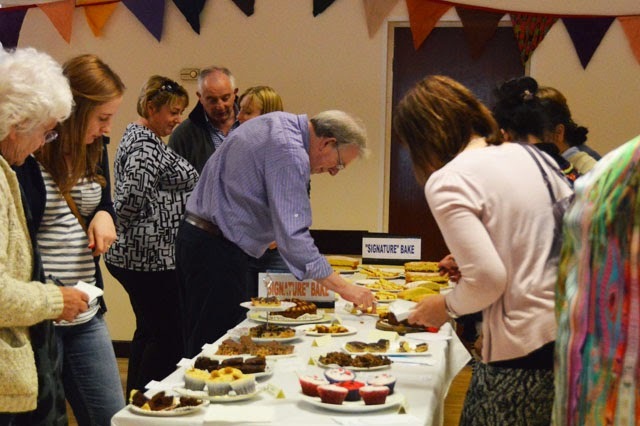 Retired of Burton Green lunch May 28th. Bookings were being taken and the police had been invited. Ross Kirby was to replace Trent. Frank Gallagher from Westwood Heath had offered to sing and raise money for Cancer Research. Diane, Mary and Hilary were organising the lunch on an American theme. Circus. Posters and tickets were now available. Committee members were urged to sell as many tickets as possible. The Jubilee group would be meeting on Thursday 7th to plan further. Bugle. The next edition would be ready for distribution on June 12th-14th. Deadline for copy was Friday May 22nd. Articles should be 400 words maximum. Welcome Pack. Judi said all changes had been done. Deirdre Vernon and Chris Langton had agreed to distribute to new people. Judi would ask them how many they wanted and print them. Actions we need to take and funding implications; information to be passed to Parish Council for consideration. Rona said she would prepare a document summarising these points to be circulated with the minutes. The final document would be confirmed at the next meeting. 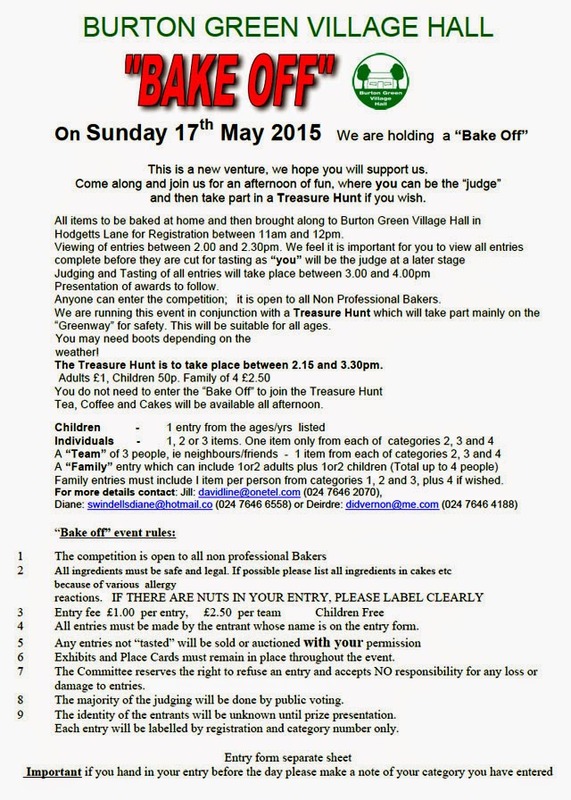 A Bake off and Treasure Hunt was to take place on Sunday May 17th. Details had been circulated and it was hoped many people would take part. Plans would be shared with the community later in the autumn. There was nothing to report. The next stage of petitioning would be with reference to AP2. There was no report. 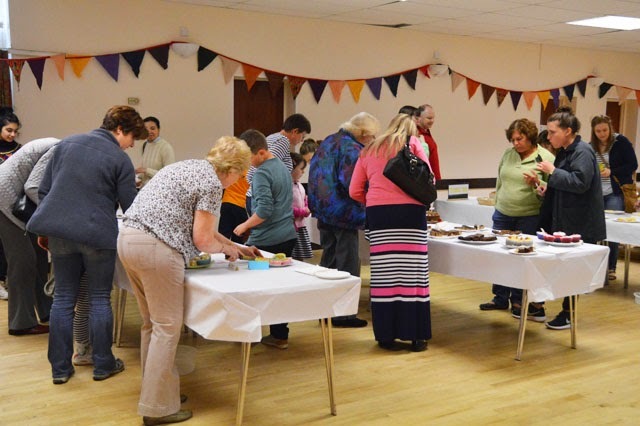 Rona had attended the Parish Meeting and the last Parish Council meeting. Vaughan Owen had resigned from the Parish Council. None of the current members had stood for re-election. Three people had put themselves forward for election and they are now deemed elected: Wendy Exton, Caryll Green and Archie Taylor. They would be looking to co-opt other members of the community. There would now be two wards: Burton Green and Warwick University. Standing for the latter would be Tracey Grant. Rona thanked the outgoing parish council. Faith would thank the school for inviting members to the Community picnic from 2:45 to 6p.m on Sunday May 10th. Mary had put up parking notices from the police. New ones were needed as the others had suffered from water damage. Could these be printed as A5 to put on windscreens of offending vehicles? Mary would check with the police. Bron reported there was a man sleeping rough on the Greenway. It was agreed to inform the community police officers. Thanks were given to Barry Putnam and Adrian Hickinbottom for planting donated daffodil bulbs in Hodgetts Lane and Red Lane. Two flower tubs had been placed in Hodgetts Lane and Red Lane. Mary reported there were perennials on offer from Coventry Council. Mary and Hilary arranged to collect some from Broadgate on the following Saturday. It was highlighted that the 87 bus now goes all the way to Solihull Monday to Saturday. The committee discussed the collection of residents' subscriptions. It was agreed not to increase the amount this year but a greater number of subscriptions was needed. The Parish Council would be asked for a donation of £350 because of increased printing costs for the Bugle. Other smaller cost cutting measures could include no refreshments at the AGM as well as seeking competitive quotes for printing the Bugle as already mentioned. 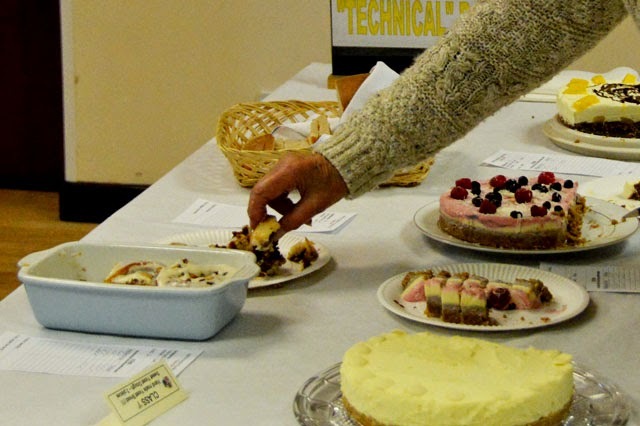 The next committee meeting would take place on July 14th at 7.30p.m.at the Village Hall. Janet and Faith gave their apologies in advance. Thanks were expressed to all for attending.